The L And I Code File Maintenance application allows the user to enter information connected with Labor and Industry Codes. L and I codes are used by some states as a form of employee contributed worker's compensation. The information entered in the application will determine how the employee and employer L and I premiums are calculated. The user may also enter G/L accounts to record employee and employer liabilities and expenses. The application provides a list function, which will print out all Labor and Industry codes on file, along with all pertinent information about them. * Select the desired mode from the L And I Code File menu bar. Enter the code, which will represent this Labor, and Industry payroll deduction code. 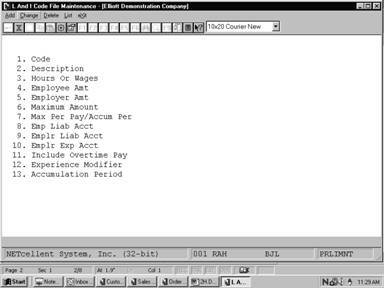 If an employee is flagged for payroll distributions and has multiple employee tax codes on file, the Time Transaction Processing application will prompt the user to enter an L and I code. In change and delete modes, press the F7 key to search for existing L and I codes. During Time Transaction Processing, the default L and I code from the employee's home state will be used as the default. Enter a description for this L and I code. This could be the state for which the code applies or a description of the type of work done for this code. This field determines whether an employee's L and I premium is based on hours worked or wages earned. The value entered in the field will effect how field #11 appears. 8 numeric digits with 5 decimal places and an optional minus sign (999.99999‑). Enter the rate at which the employee's L and I premium will be calculated. If field #3 contains an H, this will be the amount per hour. If field #3 contains a W, this will be a percent of all taxable wages earned as determined by field #11. 8 numeric digits with 5 decimal places and an optional minus sign (999.99999). Enter the rate at which the employer's L and I premium will be calculated. If field #3 contains an H, this will be the amount per hour. If field #3 contains a W, this will be a percent of all taxable wages earned as determined by field #11. 7 numeric digits with 2 decimal places (99999.99). Some states only require that the L and I premium be paid on an individual employee's wages or hours up to a maximum. If this is the case, enter the maximum hours or wages here. This field is not applicable for distributed employees. Note: The period covered by this maximum amount is determined by the value entered in the following field. Enter P to have the maximum amount entered in the previous field be per pay period. Enter A to have the maximum amount be per the accumulation period entered in field #13. This is the liability account where all amounts withheld for employee L and I premiums are posted automatically during the posting of payroll checks or manual payroll transactions. Press the F7 key to search for accounts by number or press the F8 key to search for accounts by description. This is the liability account where all amounts withheld for employer L and I premiums are posted automatically during the posting of payroll checks or manual payroll transactions. Press the F7 key to search for accounts by number or press the F8 key to search by description. This is the expense account that counterbalances the liabilities account entered in the previous field. This field controls whether or not overtime and special hours or pay are used in calculating the premiums for this L and I code. If L and I premiums are being calculated on hours worked (see field #3), this field will display as Include Overtime Hours. If L and I premiums are being calculated on gross wages (see field #3), this field will display as Include Overtime Pay. This is a state-assigned number and represents a percentage by which to multiply the calculated premium. The modifier is based on past experience of claims by employees. It defaults to 100% on initial entry. This field controls the length of the period for which L and I wages or hours will be accumulated. Enter Q to accumulate L and I totals on a quarterly basis. Enter A to accumulate L and I on an annual basis. If premiums are being calculated on hours worked, L and I may also be accumulated by pay period. If field #3 contains an H, a P may be entered here to accumulate by pay period.